Frailty may not be a term you’ve regularly come across but there are many symptoms you may feel familiar with. If you’re an elderly person suffering from frailty, you may find it difficult to stand, sit and get out of bed. You’re less likely to be able to cook for yourself, appear slow moving and unsteady on your feet and probably lack in confidence. Without intervention, you could be on the verge of having a fall. If you do fall and struggle to get back on to your feet afterwards, you might be lying on the ground for a long time, especially if you are on your own. This could lead to other health implications such as shock or hypothermia. It is sometimes the case that the person’s family considers the decision to move them into a nursing home. 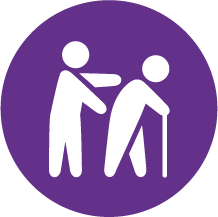 It very much depends on the case, but wherever it’s possible we do our utmost to support a person to continue living safely and independently so that they can remain active for longer. If you think you know someone in this position, please act now to provide them with the support they need to prevent them from having a fall. Mrs P had lived independently at home until a fall in her bedroom left her with a fractured hip. Her injury and frail state meant she’d been unable to lift herself back onto her feet or call for help. She’d spent several hours lying on floor before she was found. Following admittance to hospital and subsequent surgery, Mrs P returned home 10 days later but struggled to cope with her daily life. During our assessment we realised Mrs P had developed a fear of falling and lacked in confidence. Working together with Mrs P and her family, we were able to get her walking outside again and from there she quickly progressed from relying on a zimmer frame to using just one single stick. Mrs P also now wears a pendant personal alarm, on our advice, to avoid lying alone for a long time should she fall again.